In Part One of the PSN series, an overview of Fusion’s Payable Staged Network (PSN) was covered. In Part Two of the Fusion Payable Staged Network (PSN) Series, several topics will be detailed that relate to staking on the PSN including a robust FAQ section. In addition to the articles, the Official Fusion Telegram Channel is a real-time channel that is moderated 24/7 where PSN questions can be answered. Since announcing the PSN, Fusion regularly reminds FSN ERC-20 token holders to move their FSN tokens to a secure wallet to which the wallet’s private key is in the control of the user. This ensures an accurate balance of FSN ERC-20 tokens is recorded. Please note, the exact same private key used to unlock a token holder’s Ethereum-based wallet (which holds their FSN tokens), will unlock their FUSION Wallet. Without any action from the user, the P-FSN tokens equivalent to their balance in FSN tokens at the block height of Ethereum 6,868,000 will be automatically available in the user’s FUSION wallet. 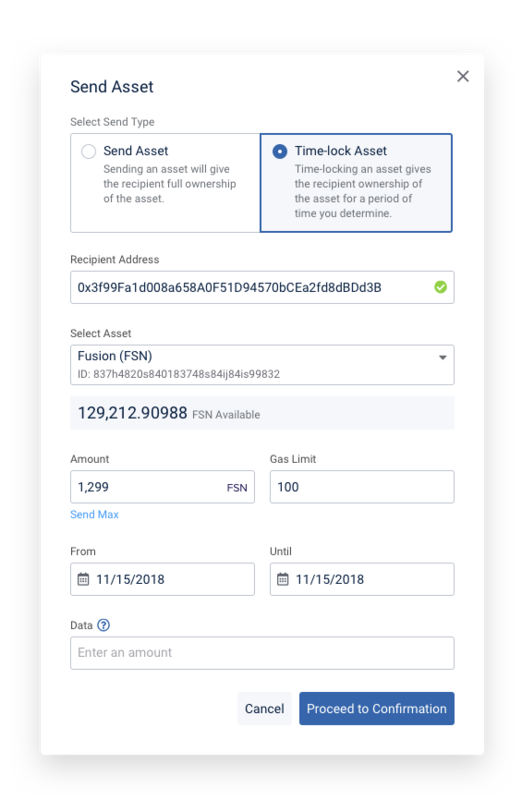 The P-FSN token will be a native token to the FUSION PSN network and will ONLY be accessible (and visible) in the FUSION PSN wallet which will be released to align with the network launch. User holds their balance of FSN ERC-20 tokens in their wallet where they control the private key. At Ethereum block height 6,868,000, Fusion takes a snapshot of the block which acts as the genesis block for PSN. The snapshot records FSN ERC-20 wallet addresses and user’s FSN ERC-20 balances. PSN tokens P-FSN are automatically sitting in all wallets at the ratio of 1:1 to FSN ERC-20 token balances. User’s FSN ERC-20 public address is used for the FUSION PSN Wallet. The FUSION PSN Wallet is unlocked with the same private key used to manage FSN ERC-20 tokens. 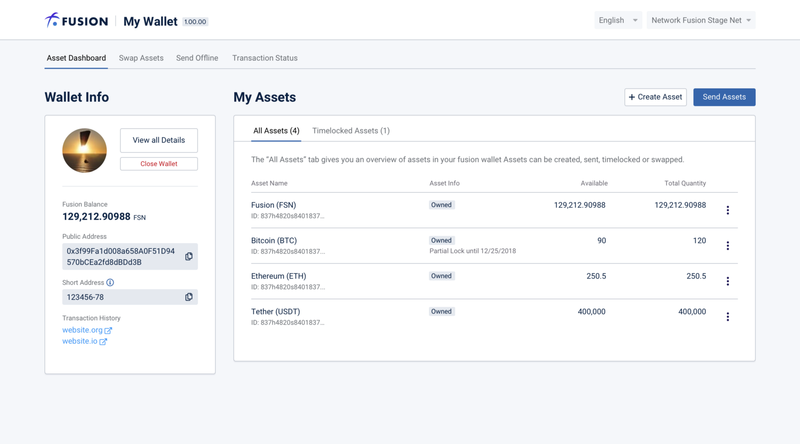 A balance of P-FSN tokens equivalent to the user’s FSN ERC-20 balance will be available to the user in the FUSION Wallet. It’s imperative for users to have access to their FSN ERC-20 private keys in order to receive P-FSN tokens. For example, if FSN tokens are left in an exchange wallet, the exchange, not the user, holds the private keys. Therefore, the exchange receives the P-FSN tokens, not the user. The user will not be able to access any P-FSN tokens. How Can P-FSN Tokens be Used? P-FSN tokens are the utility token that powers the FUSION PSN network. The tokens can be used for staking, quantum-swapping, transacting, time-locking and more. All of these functions can be tested in a completely risk-free way since the P-FSN tokens have marginal real-world value. P-FSN are testing tokens similar to Rinkenby or Bitcoin Testnet tokens. However, there is also a mechanism by which P-FSN token holders can earn real FSN ERC-20 rewards — by participating in staking. Proof of Stake (PoS) is the consensus mechanism that the PSN uses to secure and validate transaction blocks. The PoS consensus model proposes that the resource used to determine the validator of a block should be the cryptocurrency itself, rather than computational power like in the PoW-based Bitcoin network. The idea is that if in an individual possesses native tokens to the network (a ‘stake’ in the network), they have an interest in maintaining the accuracy of the ledger and can therefore be trusted to broadcast the truth when blocks are validated. The validator of a new block is chosen based on the quantity of tickets bought by participants with time locked P-FSN and transaction fees (P-FSN) are awarded to the validator of a block. There are a number of properties that make PoS more appealing than the alternative PoW systems including: improvements in energy efficiency, scaling benefits, increased decentralization, reduced risk of 51% attack, user-friendly hardware requirements and more. Q. What compatible wallets exist in the marketplace to store your FSN tokens where the user controls private keys? A. There are a number of compatible wallets that exist in the marketplace for storing FSN ERC-20 tokens for the PSN snapshot. Examples of online wallets include: MyEtherWallet, Metamask, Coinomi and MyCrypto. Compatible hardware wallets include: Ledger and Trezor. Fusion advises token holders to do their own research when selecting a wallet due to the fact that Fusion has no control over third party wallets, or their security. Q. How regularly will new blocks be generated on the PSN? A. New PSN blocks will be generated approximately every 15 seconds. A FUSION PSN block explorer will be released in the lead up to PSN launch to help with tracking. Q. How does staking work with tickets? A. To participate in staking, users buy a ticket costing 200 time-locked P-FSN. This ticket goes into a lottery. If your ticket is chosen in the lottery, then your staking node has the opportunity to validate the next transaction block, therefore earning a reward. Once your ticket is selected your 200 time-locked P-FSN tokens are returned to your wallet including the block reward. At that point, purchasing a new ticket is possible. 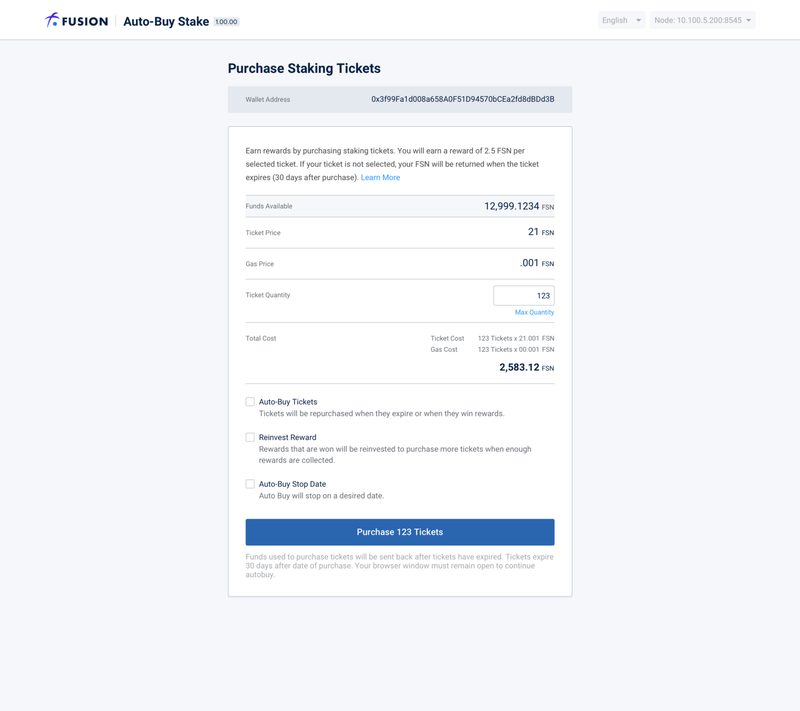 This process can be automated by using FUSION’s “Auto-Buy Ticket Function”. Q. What is the cost of purchasing a ticket to participate in staking? A. 200 time-locked P-FSN tokens (the P-FSN tokens need to be time-locked from the present time until 30 days into the future, the remaining portion from 30 days until infinite remains in your wallet) are required to buy a ticket for staking. Q. If you have less than 200 P-FSN tokens, can you use them for staking? A. If you have less than 200 P-FSN and want to participate in staking, you’ll either have to get more P-FSN tokens from a counterparty to reach the 200 P-FSN to buy a ticket for staking. Alternatively, you can time-lock your P-FSN and use the quantum-swap function so a counterparty can reach 200 P-FSN tokens to purchase a ticket for staking. The terms of the deal will be up to you and your counterparty! Q. What are the rewards if your ticket is selected to pack a PSN block? Once the block is validated, your 200 time-locked P-FSN tokens will be returned to your wallet with an additional reward of 2.5 P-FSN (not time-locked) tokens. The FUSION Foundation will also deliver a bonus reward of 0.625 FSN ERC-20 tokens for each block to the block validator at a later date yet to be determined. The bonus FSN will be sent to your Ethereum-based wallet not the native FUSION PSN Wallet. Q. How many P-FSN and how many ERC-20 FSN will be rewarded per day? A. On average, a total of 14,400 P-FSN and 3,600 FSN ERC-20 token rewards will be issued per day. Q. How many tickets can a user buy per block? A. One ticket can be purchased every time a new block is forged per FSN ERC-20 public wallet address. This means 5,760 tickets is the maximum number of tickets that can be purchased per address, per day. Q. How and when will FSN block rewards be distributed? A. The FUSION Foundation will monitor the addresses that are selected to pack each block and will reward 0.625 FSN to the address that successfully validates each block. The rewards will be distributed at a time selected by FUSION. FSN rewards are paid from the community allocation of FSN tokens. Q. What triggers the return of time-locked 200 P-FSN tokens used for staking? 1. If your staking ticket is selected, then your 200 P-FSN tokens plus the block reward are returned to your wallet. 2. If your staking ticket is not selected within 30 days, the 200 P-FSN that are time-locked will automatically expire, and the 200 time-locked P-FSN used to buy the staking ticket is returned to your wallet. Q. Can time-locked P-FSN you swapped from a counterparty be used for staking? A. Yes, time-locked P-FSN from the present time until 30 days into the future are the only tokens qualified to buy tickets for staking. It does not matter if those P-FSN tokens arrived in your wallet via the snapshot, a trade, or a swap. Q. Are FSN tokens tracked separately on the Ethereum blockchain during PSN? A. Yes. The Ethereum Blockchain will continue to book the ledger for FSN ERC-20 tokens which will be swapped to native FSN tokens once the Fusion mainnet goes live. Q. When can I send back my FSN to an exchange wallet after the snapshot on block 6,868,000? A. After the 6,868,000 Ethereum block is forged, it is possible to move FSN ERC-20 tokens back to an exchange wallet, while still receiving P-FSN tokens. Q. Can a user sell ERC-20 FSN after the snapshot and will it influence staking reward? A. Yes, a user can do whatever they want with their ERC-20 FSN after the snapshot and it will not influence staking rewards in P-FSN or FSN ERC-20. Q. What hardware requirements are needed for staking? A. More information may be disclosed in the lead-up to the launch of PSN if necessary. At this time, it’s anticipated a standard VPS, 2 cores, 4GB RAM is currently sufficient to set up and run a node. Q. Will fusion make it easy for me to run a node, manage tokens and set time-lock? 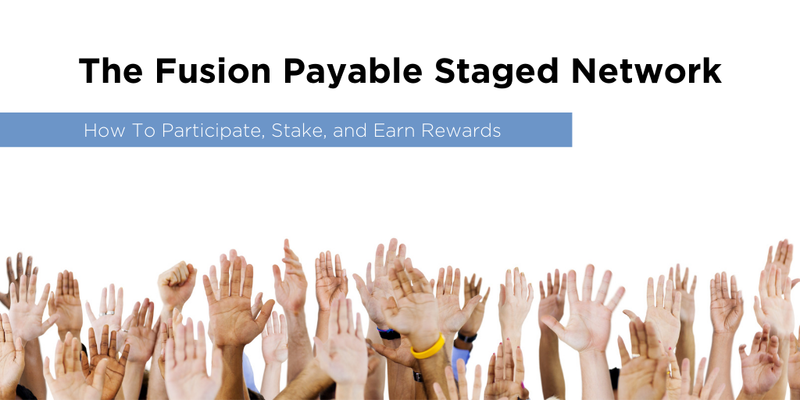 FUSION is excited to be incentivizing staking on the FUSION PSN with valuable FSN ERC-20 rewards. We hope to see as many people participating as possible! This way, we can test the robustness, security and functionality of the network together.